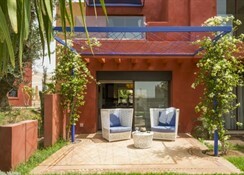 Located in Marrakech, Le Vizir Center Park & Resort is a great choice for families. This luxurious hotel has a total of 70 bedrooms. The hotel has private parking as well as an airport shuttle service for the convenience of guests. The hotel houses two amazing restaurants and a snack bar. It is impossible to get bored at the hotel thanks to the entertainment offerings. The wide variety of activities and animations include various types of outdoor sports. Some of these services may incur an additional cost. There is Wi-Fi connection throughout the hotel and a 24-hour reception. 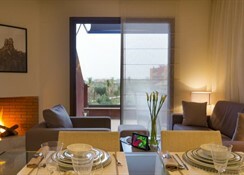 Le Vizir Center Park & ​​Resort is about 10km from Downtown Marrakesh. A supermarket is about 6km from the hotel. There are several bars and restaurants 4km from the hotel’s doorstep. Further entertainment such as a cinema can be found approximately 15km away. The Menara Airport is about 15km. 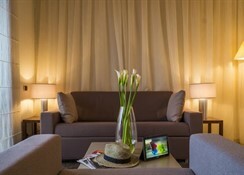 The 70 air conditioned guestrooms are equipped with a fireplace, flat-screen TV and a furnished balcony. 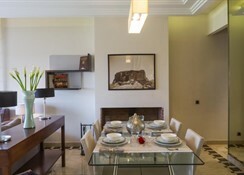 The rooms feature high quality bedding or a double sofa bed. The free Wi-Fi internet will keep you in touch with your loved ones; you can also watch your favourite show on the television with satellite channels. 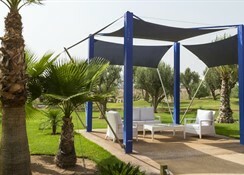 The Le Vizir Center Park & ​​Resort houses three amazing restaurants serving delicious cuisines from around the world. All meals prepared at the restaurants are halal. Bars at the hotel are Le Churchill, Le Marocain, a poolside bar and the L'italie bar. The activities and leisure opportunities offered by Le Vizir Center Park & Resort are numerous and varied, among them are a tennis court, a basketball court a football field, a water park, hiking, table tennis, darts, archery and more. Children too will have a great time at the hotel’s kid’s club, playground, and the children’s pool. The hotel also has various activities and entertainment shows exclusive for children. Guests can relax at the spa centre, solarium, or work up a sweat at the fitness centre. The three swimming pools, with sun beds are the perfect place to lounge with a cocktail or beer in hand.